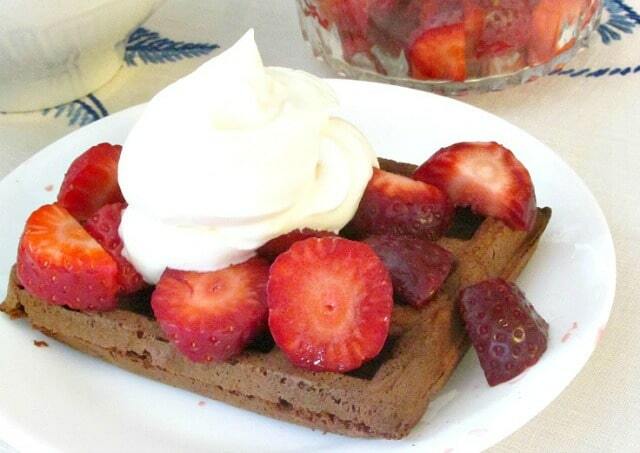 Who said waffles have to be breakfast? I’ve seen savory waffles – waffles with chicken and gravy is a classic. They can be used instead of patty shells. Waffle sandwiches are lots of fun! And many of my older cookbooks have waffles served as dessert. These chocolate waffles, with fruit and whipped cream, are a lovely dessert, or – full circle – a fun brunch. My family has a tradition of strawberries for Easter, and I enjoy finding different ways to serve them – and chocolate sets them off so beautifully! 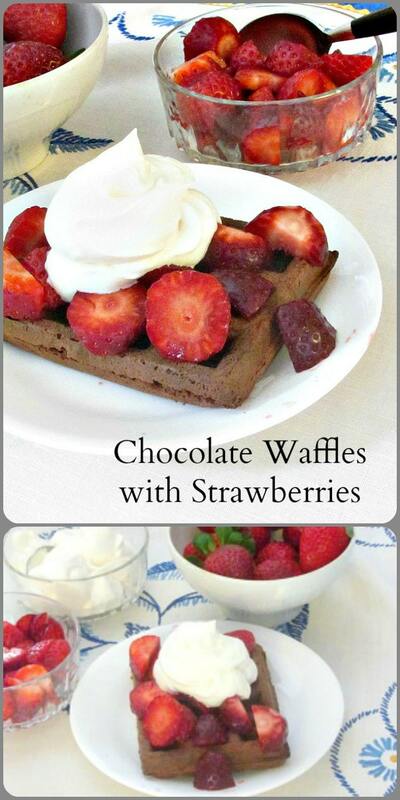 Now these are chocolate waffles for the lover of very dark bitter chocolate… I don’t add sugar, just fruit, so you have to like the real deep chocolate flavor, and you probably don’t want to eat them alone… but with sweet fruit and rich cream, the flavors balance beautifully. 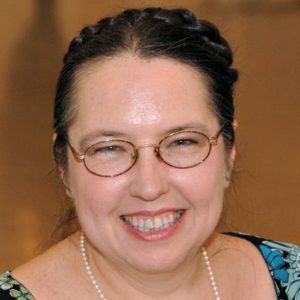 If you, or others at your table, want a sweeter flavor, I would suggest keeping the waffles as they are but sweetening part of the fruit or cream – I learned long ago that this was a good way to make a dessert I could eat and my guests liked. Rich, who does eat sugar, likes these, but he always did prefer the 85% cocoa chocolate… He commented, when I was making them, that they smelled like brownies, and they did, but they do not taste like brownies – not rich enough. Buckwheat has this texture also. When I think of buckwheat, the assertive toasted grain always comes to mind first, but raw buckwheat is mild… and I’d been surprised a while ago to open a bag from a new (to me) supplier and find the mild creamy looking flour. 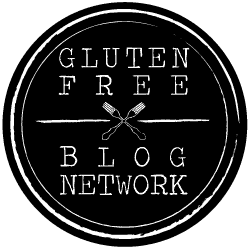 If you can’t get that, you can get whole raw groats sold as cereal and grind them yourself in a coffee grinder – I’ve seen several gluten free bakers suggest that. It’s worth it – it did just what I needed, in terms of texture, with a nice light flavor. 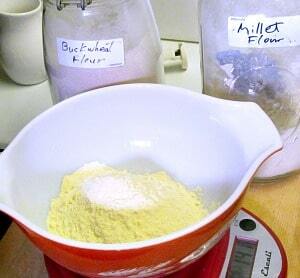 Weigh the flour, as that really does work best with the variety of flours. I chose to mix buckwheat flour with my standard millet flour. 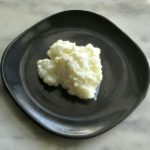 It is a whole grain, but its ratio of starch/fiber/protein – and its taste – aren’t far off that of white AP flour, and I find it a good base flour for baking. 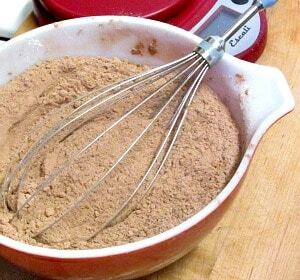 Mix the two flours with unsweetened cocoa powder, and stir in baking powder and salt. I like to use a whisk to stir them all together – I find that simply turning it helps bring flour up from the bottom of the bowl, and mixes dry ingredients well. Then put that aside. Even liking the bitter chocolate, you may want a little sweetness to balance it in the waffle itself – so take a ripe banana and mash it. Then beat it well with eggs, milk, a little neutral flavored oil, and vanilla. Beat them thoroughly, then add the dry ingredients a little at a time, and beat until completely combined. Then set aside to rest for half an hour. This lets the flour hydrate, and greatly improves the texture of the finished product. And if it makes more sense for you, as it well may, make the batter, cover and refrigerate it until you are ready… Sitting in the fridge for a few hours won’t hurt it. You can also, of course, make the waffles ahead, then heat them in oven or toaster to serve. While the batter rests, wash, trim, and cut up your strawberries. 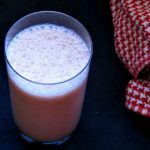 Other than Easter, I usually wait until I can get local strawberries, because they are fully ripe – unfortunately what we could find in the local stores this week, for an early Easter, were definitely not… I will repeat this recipe in June, with luscious ripe berries! And if you do want to add sugar anyplace in the recipe, this is the place. Just a teaspoonful will draw juice out of the fruit, making them juicier as well as sweeter. (I sometimes do that for guests, after reserving my own.) Also, whip cream. I add a little vanilla, and a little almond extract. You don’t specifically taste the almond, but there is a slightly more complex and sophisticated flavor. Then make waffles, following the directions on your waffle iron. Unfortunately they vary so much that I can’t really be more specific. This recipe made me a dozen waffles. Serve the waffles with a spoonful of berries, and a dollop of whipped cream – and enjoy! 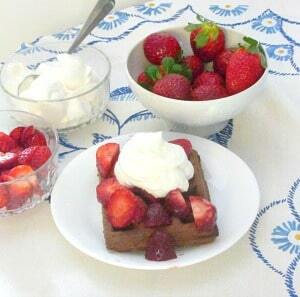 Gluten free, sugar free chocolate waffles with strawberries and whipped cream - dessert, brunch, whenever you'd like a treat! Combine millet and buckwheat flour, cocoa powder, baking powder and salt in a bowl. Mix well and set aside. 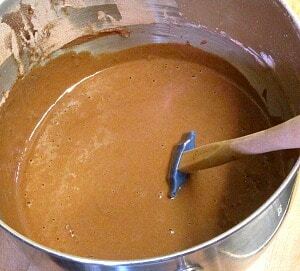 Beat dry ingredients into wet ingredient mixture until well blended. Set aside to rest half an hour. Wash, hull, trim, and cut up berries, and set aside in refrigerator. Blend remaining 1/2 t vanilla and almond extract into cream, whip. Refrigerate. Use batter to make waffles according to instructions for your waffle iron. When ready to serve, arrange berries on waffles, and add a dollop of cream - or pass bowls of each for people to serve themselves. 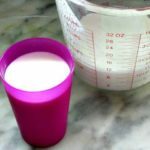 I listed amounts of berries and cream sufficient for the full recipe - but you can also do as I did, and serve the waffles you want for a given meal with smaller amounts of fruit and cream, and freeze the rest of the waffles for another time. These look delightful. I'm inspired to buy a waffle iron now. Thank you! You know, it's fascinating the things people are doing with them, these days. 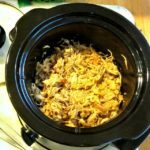 Not just a one use gadget - you can make sweet and savory waffles, and I've seen hash browns cooked in the irons! Chocolate and berries are never a bad idea. YUM! Absolutely. LOL Cream never hurt either of them either... Thank you! Um... Yum! I would jump out of bed for this breakfast! LOL - as Not a Morning Person, I appreciate that! We also use buckwheat to make pancakes. I love the flavor and find it more filling than plain or all purpose flour. 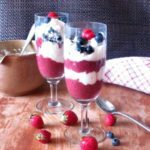 Your recipe is perfect with the chocolate and the berries. Buckwheat pancakes are a classic - and I noticed the texture making them. I'd always used the toasted flour, though, so this was a new thing for me! I love trying, and learning about, all these different kinds of flours - so much to play with! And thank you! I need to get waffle iron too:D. These waffles are delightful! Thank you! I'd had a good waffle iron years ago (which had been my mom's and eventually stopped working.) Did without, then got... well, a kind of mediocre one, which I used occasionally, but it really never got hot enough, so was very slow (and the waffles were a bit heavy.) I got a good one last Fall - and I'm so glad I did! I've really been having fun with all the different kinds of waffles I can make - and I haven't even branched out from waffles, as I've seen others do! What a great breakfast for valentine's day!! These look amazing! My husband would be so happy if I made these for him. We actually did eat it as dessert - and loved it! I hope you do too! 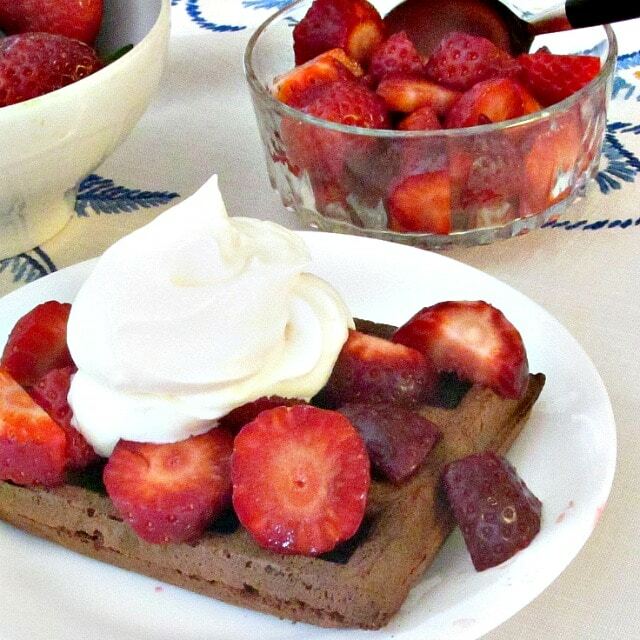 Chocolate, waffles, and strawberries are three of my favorite things! I'm planning to do a health-related gluten fast soon, so I'll definitely be making these! LOL - sharing this reminded me how much I like the combination, myself! Hope you enjoy it, and hope you get answers! Okay, now I really want to get a waffle iron!! This looks so good! It's funny - I really should use it more than I do, but when I didn't have one I missed it. (And then I was just using plain recipes - I've had so much fun making interesting ones!) And thank you! Yum, this is the best workaround I've seen for dessert for breakfast. I'll take it! LOL - Or breakfast for dessert. Whichever... I've served them both ways, and they're fun at any meal.